Master keying systems are used for commercial applications so that you can restrict who has access to different doors and which have an overriding master key. Our records enable duplicate keys or additional locks to be supplied with ease and accuracy but only on receipt of an official order, with all special records kept in strictest confidence. 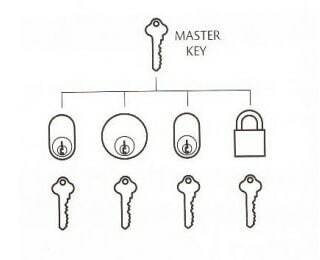 We also do keyed to differ and keyed alike systems that don’t require a Master key. 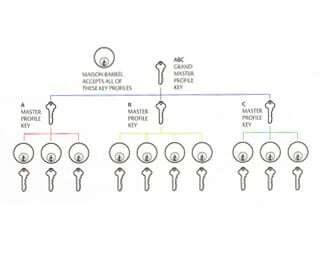 A Master Keyed System is one where each lock has it own individual key which will not operate any other lock in the system, but where all locks in the system can be operated by one master key. 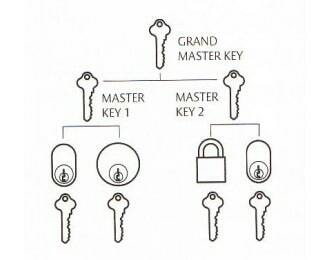 The Grand Master Keyed System is an extension of the Master Keyed System where each lock has its own individual key and the locks are divided into two or more groups. 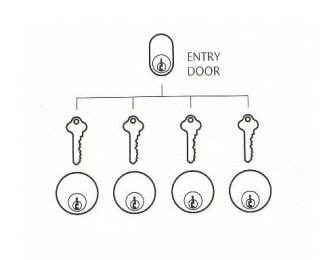 Each group of locks is operated by a master key and the entire system is operated by one grand master key. This system is widely used in apartments, flats, office blocks, hotels and motels. Each apartment, flat or office has its own individual key which will not operate the lock to any other apartment, flat hotel room or office but will operate the locks to communal entry doors and other services areas. A system where it is necessary for contractors to gain entry to a building during construction. 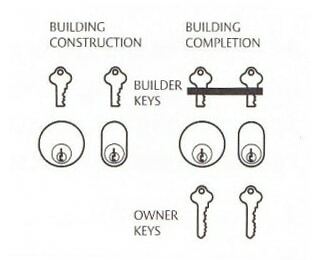 Once construction is complete the owners keys will block further access by contractors.